It’s a great privilege for me to have the opportunity of speaking at this meeting of Commonwealth countries on education. I am also very happy that you have chosen Edinburgh as the venue of this important conference. I am very proud of my own association with Edinburgh, through being an alumnus of two universities here, Edinburgh University and Heriot-Watt University (admittedly my connections are only through honorary degrees but they generate a sense of closeness to the real students here), and also through belonging to the Royal Society of Edinburgh and having other associations with this great city. So I welcome you to beautiful Edinburgh and to its wonderful intellectual community, of which I am privileged to be a nomadic member, as something of an academic gypsy. But to this welcome I must add my belief that there could not be a better place for a meeting on “closing the gap” in education than the city of Adam Smith and David Hume, the earliest and greatest champions of education for all. Why is it so important to close the educational gaps, and to remove the enormous disparities in educational access, inclusion and achievement? One reason, among others, is the importance of this for making the world more secure as well as more fair. HG Wells was not exaggerating when he said, in his Outline of History: “human history becomes more and more a race between education and catastrophe.” If we continue to leave vast sections of the people of the world outside the orbit of education, we make the world not only less just, but also less secure. The precariousness of the world is now greater than it already was in HG Wells’s time in early twentieth century. Indeed, since the terrible events of September 11, 2001 – and what followed after that – the world has been very aware of problems of physical insecurity. But human insecurity comes in many different ways – not just though terrorism and violence. Indeed, even on the very day of September 11, 2001, more people died from Aids than from physical violence including the atrocity in New York. Human insecurity can develop in many different ways, and physical violence is only one of them. While it is important to fight terrorism and genocide (and in this too, education can have a big role, as I will presently discuss), we must also recognise the plural nature of human insecurity and its diverse manifestations. The most basic issue relates to the elementary fact that illiteracy and innumeracy are forms of insecurity in themselves. Not to be able to read or write or count or communicate is a tremendous deprivation. The extreme case of insecurity is the certainty of deprivation, and the absence of any chance of avoiding that fate. The first and most immediate contribution of successful school education is a direct reduction of this basic deprivation – this extreme insecurity – which continues to ruin the lives of a large part of the global population, not least in the Commonwealth. The difference that basic education can make to human life is easy to see. It is also readily appreciated even by the poorest of families. Speaking personally, it has been wonderful for me to observe how easily the importance of education is perceived even by the poorest and the most deprived of families. This emerges from some studies on primary education in India that we are currently undertaking (through the “Pratichi Trust” – a trust aimed at basic education and gender equity that I have been privileged to set up in India and Bangladesh through using my Nobel Prize money from 1998). As the results of our studies come in, it is remarkable to find how the parents from even the poorest and most depressed families long to give basic education to their children, to make them grow up without the terrible handicaps from which they – the parents – had themselves suffered. Indeed, contrary to claims often made, we have not observed any basic reluctance by parents to send their children – daughters as well as boys – to school, provided affordable, effective and safe schooling opportunities actually exist in their neighbourhood. Of course, there are many obstacles in giving shape to the dreams of parents. The economic circumstances of the families often make it very hard for them to send their children to school, particularly when there are fees to be paid. There are other obstacles too. Sometimes the schools are very thinly staffed (many primary schools in developing countries have only one teacher), and parents are often worried about the safety of children, especially girl children (particularly in case the teacher fails to turn up, which seems to happen often enough in many of the poorer countries). Quite often, the parents’ reluctance has a rational basis, and these gaps too need to be addressed. Not surprisingly, all the cases of speedy use of the opportunities of global commerce for the reduction of poverty have drawn on help from basic education on a wide basis. For example, in Japan, already in the mid-19th century the task was seen with remarkable clarity. The Fundamental Code of Education, issued in 1872 (shortly after the Meiji restoration in 1868), expressed the public commitment to make sure that there must be “no community with an illiterate family, nor a family with an illiterate person”. Thus – with the closing of educational gaps – began Japan’s remarkable history of rapid economic development. By 1910 Japan was almost fully literate, at least for the young, and by 1913, though still very much poorer than Britain or America, Japan was publishing more books than Britain and more than twice as many as the United States. The concentration on education determined, to a large extent, the nature and speed of Japan’s economic and social progress. It also has a gender connection since it can be a very important issue for women’s security. Women are often deprived of their due, thanks to illiteracy. Not being able to read or write is a significant barrier for underprivileged women, since this can lead to their failure to make use even of the rather limited rights they may legally have (say, to own land, or other property, or to appeal against unfair judgment and unjust treatment). There are often legal rights in rulebooks that are not used because the aggrieved parties cannot read those rulebooks. Gaps in schooling can, thus, directly lead to insecurity by distancing the deprived from the ways and means of fighting against that deprivation. Fifth, basic education can play a major role in tackling health problems in general and epidemics in particular. It is easy to see the importance of specialised health education (for example, on the way infections spread and how diseases can be prevented). But even general education can broaden a person’s lines of thinking and generate social understanding in ways that may be extremely important in facing epidemiological problems. Indeed, some studies have suggested that general school education has a bigger impact on health than specialised health education itself has. Sixth, empirical work in recent years has brought out very clearly how the relative respect and regard for women’s well-being is strongly influenced by women’s literacy and educated participation in decisions within and outside the family. Even the survival disadvantage of women compared with men in many developing countries (which leads to such terrible phenomenon as a hundred million of “missing women”) seems to go down sharply – and may even get eliminated – with progress in women’s empowerment, for which literacy is a basic ingredient. There is also considerable evidence that fertility rates tend to go down sharply with greater empowerment of women. This is not surprising, since the lives that are most battered by the frequent bearing and rearing of children are those of young women, and anything that enhances their decisional power and increases the attention that their interests receive tends, in general, to prevent over-frequent child bearing. For example, in a comparative study of the different districts within India, it has clearly emerged that women’s education and women’s employment are the two most important influences in reducing fertility rates. In that extensive study, female education and employment are the only variables that have a statistically significant impact in explaining variations in fertility rates across more than three hundred districts that make up India. In understanding inter-regional differences, for example the fact the state of Kerala in India has a fertility rate of only 1.7 (which can be roughly interpreted as 1.7 children on average per couple) in contrast with many areas which have four children per couple (or even more), the level of female education provides the most effective explanation. There is also much evidence that women’s education and literacy tend to reduce the mortality rates of children. These and other connections between basic education of women and the power of women’s agency (and its extensive reach) indicate why the gender gap in education produces heavy social penalties. I have so far concentrated on gaps in access, inclusion and achievement that differentiate one group of people from another. But this is also a good occasion to reflect a little on the gaps – of a very different kind – that exist in the coverage of the school curriculum. The nature of the curriculum is, of course, of obvious relevance to the development of technical skills (such as computing) that facilitate participation in the contemporary world. But there are also other issues involved, since schooling can be deeply influential in the identity of a person and the way we see ourselves and each other. Indeed, the nature of education is quite central to peace in the world. Recently the very deceptive perspective of the so-called “clash of civilisations” (championed particularly by Samuel Huntington) has gained much currency. It is important to see that what is most immediately divisive in this kind of theorising is not the silly idea of the inevitability of a clash (that too, but it comes later), but the equally shallow prior insistence on seeing human beings in terms of one dimension only, regarding them just as members of one civilisation or another (defined mostly in terms of religion), ignoring their other affiliations and involvements. There are two mistakes here. First, the classification is very crude. For example, India is put in the box of Hindu civilisation, even though with its 130 million Muslims (more than the entire British and French populations put together), India has many more Muslims than most so-called “Muslim countries” in the world. Huntington’s classification gives comfort only to Hindu sectarians. The second mistake is to assume that a person’s religion defines him or her reasonably adequately. But every human being’s identities have many different components, related to nationality, language, location, class, occupation, history, religion, political beliefs, and so on. A Bangladeshi Muslim is not only a Muslim, but also a Bengali and possibly quite proud of the richness of the Bengali literature and other cultural achievements. Similarly, the history of the Arab world with which an Arab child today can potentially related is not only the achievements of Islam (important as they are), but also the great secular accomplishments in mathematics, science and literature which are part and parcel of Arab history. Even today when a scientist in, say, the Imperial College uses an “algorithm,” he or she unconsciously celebrates the innovativeness of the ninth-century Arab mathematician, Al-Khwarizmi, from whose name the term algorithm is derived (the term “algebra” comes from his book, “Al Jabr wa-al-Muqabilah”). To define people just in terms of religion-based classification of civilisations can itself contribute to political insecurity, since in this view people are seen as simply belonging to, say, “the Muslim world,” or “the Western world,” or “the Hindu world,” or “the Buddhist world,” and so on. To ignore everything other than religion in classifying people is to set people up in potentially belligerent camps. I personally believe that even the UK government makes a mistake in expanding, rather than reducing faith-based state schools, adding for example Muslim schools, Hindu schools and Sikh schools to pre-existing Christian ones, especially when the new religious schools leave children very little opportunity to cultivate reasoned choice and decide how the various components of their identities (related respectively to language, literature, religion, ethnicity, cultural history, scientific interests, etc) should receive attention. There is need not only to discuss the importance of our common humanity, but also to stress the fact that our diversities can take many distinct forms and that we have to use our reasoning to decide how to see ourselves. The importance of non-sectarian and non-parochial curricula that expand, rather than reduce, the reach of reason can be hard to exaggerate. Shakespeare talked about the fact that “some men are born great, some achieve greatness, and some have greatness thrust upon them.” In the schooling of children, we have to make sure that we do not have smallness thrust upon the young. The Commonwealth … is an entirely new conception built on the highest qualities of the spirit of man: friendship, loyalty and the desire for freedom and peace. Basic education is not just an arrangement for training to develop skills (important as that is), it is also a recognition of the nature of the world, with its diversity and richness, and an appreciation of the importance of freedom and reasoning as well as friendship. The need for that understanding – that vision – has never been stronger. Amartya Kumar Sen is an Indian economist and philosopher who since 1972 has taught and worked in the United Kingdom and the United States. He has made contributions to welfare economics, social choice theory, economic and social justice, economic theories of famines, and indexes of the measure of well-being of citizens of developing countries. He was awarded the Nobel Memorial Prize in Economic Sciences in 1998 for his work in welfare economics. 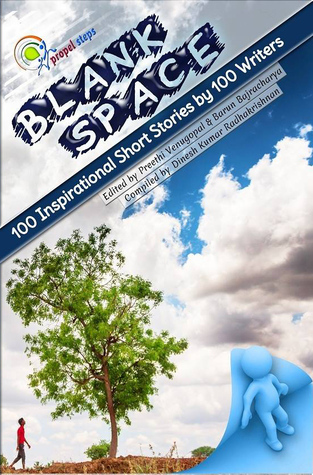 We take this special moment to thank everyone who has contributed their stories for Blank Space – Filled with Inspiration, an anthology of 100 short stories by 100 people around the globe. We are so thankful to you from deep within our soul. We owe our sincere gratitude, especially for your patience and revamping support that have given, to fine tune the stories. We have reached 70% of the selection and we never thought it would be possible for a debutant publisher like us. All we can say is that our passion behind this initiative and your support are the only reason, which made this possible. Just 30 more stories to go to complete the selections. So we are extending the final date of submission to 15th of August 2014, also, many writers asked us for some time. Even we need time to spend our quality time with each writer, communicating the feedback and make Blank Space as best as we can. Note : A few of you may be awaiting for our selection feedback. We apologize for the delay in the feedback if happened. For sure every entrant will get the feedback personally from me. Those who has mailed your story on or before 28th July, will get the feedback on or before 23:59hrs IST (today) and those who send their entries from 29th July onwards to 8th August shall get the feedback on or before 10th August. All entries after 10th August shall get the feedback only on August 16th. You can get more details by mailing here Publish@propelsteps.com , where you can also send your entries. Word limits: Max 1000 words, but if needed it can be flexible with more words. There is no minimum words limit, however we suggest keeping it as a short story, unlike a few lined flash fiction. You try your best to keep the words less complex for the readers to understand, because many people are scared away from books because of this. Of course, we wish you show your writing skills, in terms of expression and feelings. Meanwhile, we together need to commit simplicity to the reader. No need to stress much about this if you can’t help with this, our editor will do it. Publish as (Pen name) : Mention only if you prefer any other pen name. A short bio about you : Max 60 words.